You might know that BANANO was forked from NANO pretty exactly one year ago. 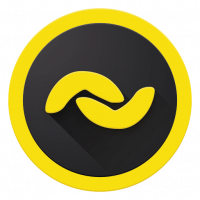 BANANO was airdropped to NANO holders for the first time back in April 2018. Since then, BANANO has profited from the tech development of NANO, and BANANO has grown a lot with lots of new, unique features and innovative faucet games facilitating ongoing free and fair distribution. Natrium, now one of the most popular mobile wallets for NANO, has been developed by the BANANO team, but we want to give back more to the NANO community! 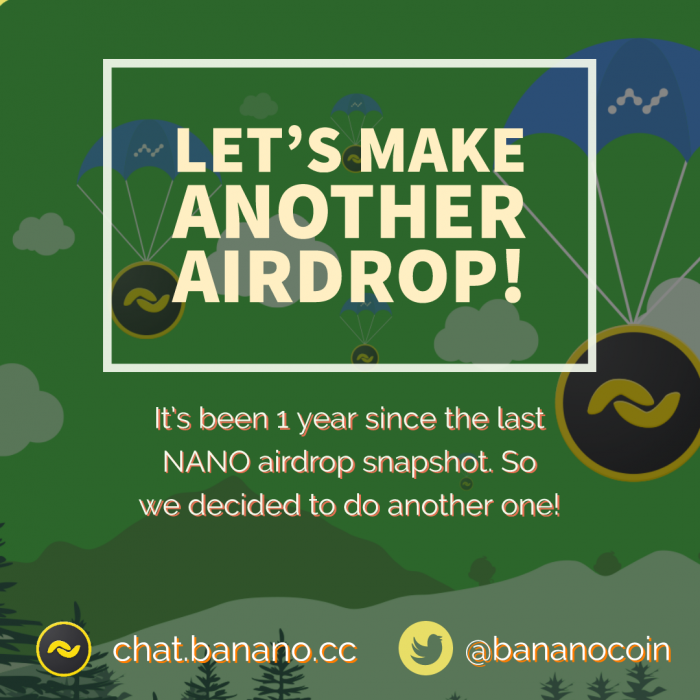 That’s why we are doing a second BANANO airdrop to NANO holders now! Learn below how to claim it, and tell your friends so they won’t miss this one! For those of you who don’t know BANANO yet: BANANO is a feeless, rich in potassium cryptocurrency powered by DAG technology distrupting the meme economy. Yes, it’s a meme coin that was forked in April 2018 from the cryptocurrency NANO. This means BANANO has all the features of NANO, such as feeless and near-instant transactions, and has a highly active community and ongoing technical development. In addition, BANANO has great memes, is intuitive and easy to use, and we have a slick mobile wallet (android and iOS) named Kalium (with monKeys ❤ — just get a wallet now and see how your’s will look!). BANANO also has a free ongoing distribution through innovative faucet games. Yes, you heard it right, Faucet Games that enable you to easily earn free BANANO. You can find lots of more details on our official website: banano.cc. Help getting started can be found on banano.how — It takes only few minutes to set up a BANANO wallet address, we recommend using Kalium. tldr: If you owned NANO on April 8th, elect xrb_1bananobjcrqugm87e8p3kxkhy7d1bzkty53n889iyunm83cp14rb9fin78p as your NANO representative and get BANANO on your NANO addresses in return — within seconds. You can switch back to a different representative afterwards. As soon as our node discovers a block with the BANANO representative, the payment will go out instantly to the same address as your NANO address, just with ‘ban’ instead of ‘xrb’ as the prefix. That means, you can access the BANANO funds with the same seed as your NANO account. You can check BANANO account balances at Creeper, our Network Explorer. For participating in this airdrop, you can use any wallet that allows a representative change (won’t work for exchanges or tipbots). Unfortunately it is also extremely complicated to access these funds with the Ledger Nano S hardware wallet because of the way it generates private keys. To access the funds you can use the great "Wallet Sweep/Load from Paper Wallet" feature in Kalium to transfer your airdropped BANANO to your main Kalium wallet. There is no need to hurry in withdrawing these coins, because the coins are yours and under your control only as soon as we sent them out. In case it does not work or the distribution wallet is empty, you can try it again later. Participating in this airdrop is free. You don't have to send any coins. NANO network snapshot was taken on April 8th, 2019 around 4 am CET. 5,000 BANANO maximum per account. Maximum 5 accounts per user. NANO accounts with balances less than 0.1 NANO will be ignored. The maximum possible amount of coins this airdrop can give away is 238 Million. 180,000 accounts are eligible. 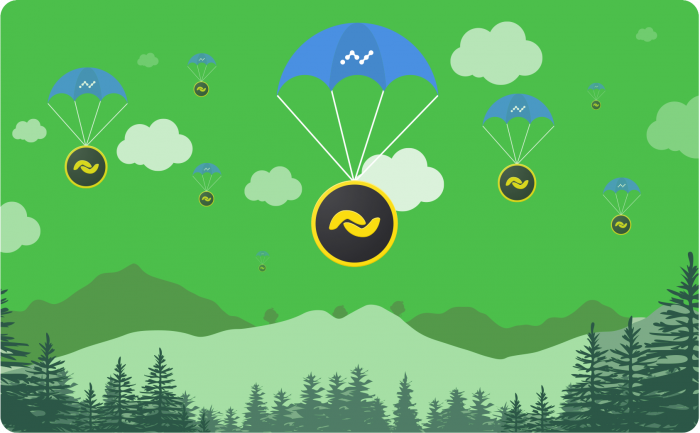 The airdrop will run for a prolonged time, so you can tell other NANO hodlers about it and they will get their BANANO starter kit even if they don't want to participate in our social media. If you have questions or like to discuss more about this airdrop, head over to our Discord server or this Reddit post. Since BANANO is distributed for free, there are always several options to get free BANANO. An up-to date summary can be found on banano.how, otherwise you might want to use the BANANO Miner Faucet or the faucet at Monkey Talks to get some free BANANO quite easily. Also make sure to follow our social media channels for regular giveways, contests and airdrops.